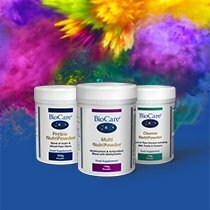 At BioCare, we offer a number of supplements to support healthy hair, skin, nails and eyes. All our products benefit from high quality ingredients provided in their most bioavailable form, ensuring optimum absorption of these valuable nutrients. As well as using a rich mix of powerful antioxidants that help protect cells from oxidative stress, our products include nutrients with specific benefits – such as copper, which contributes towards healthy skin and hair pigmentation. Browse our products below, or read more about supplements for hair, skin, nails and eyes. Collagen is a mix of various amino acids that supports the body’s connective tissue as well as hair, skin and nails. 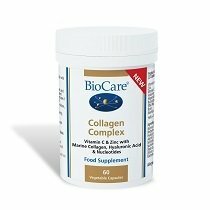 At BioCare, we offer Collagen Complex, which uses a type 1 marine collagen that is identical to the protein produced in the body. Collagen Complex also benefits from a number of antioxidants plus nucleotides, which are the basic building blocks of DNA. Vitamin E is a fat-soluble antioxidant that can help protect skin cells from oxidative stress. At BioCare, we offer a number of different vitamin E supplements, including MicroCell® Vitamin E 200 capsules and Nutrisorb® Liquid Vitamin E, which is a potent liquid supplement that you can take under your tongue or by adding to a cold drink. Our Hair and Nail Complex is an effective combination of vitamins, minerals, amino acids and plant extracts. It includes horsetail extract – which improves the condition of skin, hair and nails – and copper, which supports skin and hair pigmentation. 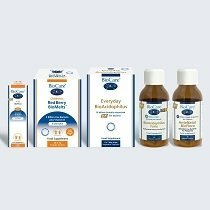 Glucosamine is a popular supplement choice, and at BioCare we offer two glucosamine products with a different emphasis to meet particular needs. Glucosamine MSM Complex provides 1500mg of both glucosamine and methyl sulphony methane (MSM), plus 300mg of chondroitin sulphate. MSM Plus provides double the amount of MSM with slightly lower levels of glucosamine, plus a generous dose of vitamin B6. We also produce EyeCare Plus, a potent mix of vitamins and minerals with plant extracts and herbs that supports healthy vision. Its premium grapeseed extract – Vitaflavan® – provides an exceptional standard of bio-available polyphenols, and the super-antioxidants in bilberry help maintain retinal function.